This door is in what claimed to be the oldest building in the United States. It is the oldest photograph I have on display. I exposed the negative in 1967. I had just joined a local camera club, which had chosen “Doors” as an assignment for its members. 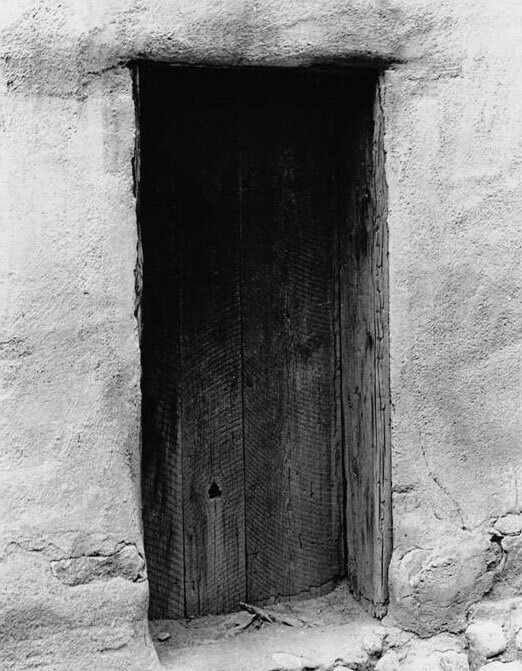 “Old Door” was one of two photographs I submitted for judging. The other won third place; “Old Door” won nothing. This photograph, for me, says something about the essence of a door. It is just an opening in a wall, closed off by some wood. In the darkness on the other side is something unknown. My other submission was a picture of a very unusual door. I have still never seen another like it. I thought “Old Door” was by far the better photograph. Being only fifteen years old, I did not know what I wanted to do with photography. From this camera club contest, I did learn that it was not simply to take pictures of unusual objects. I never went to another meeting. Nevertheless, I learned a lot from that camera club.